E-textiles, also known as soft circuits or sewable electronics, are a great way to blend art and design topics with STEM. 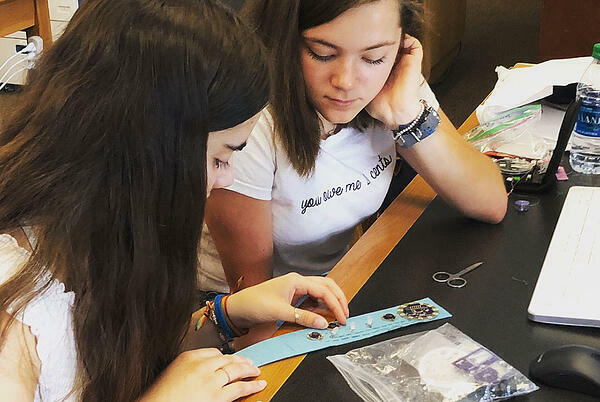 Today we are highlighting three summer programs using LilyPad sewable electronics to inspire young women to gain experience in engineering through creating wearable technology projects. Founded at Standford University in 1999, Digital Media Academy focuses on STEM and tech education for students of all ages. 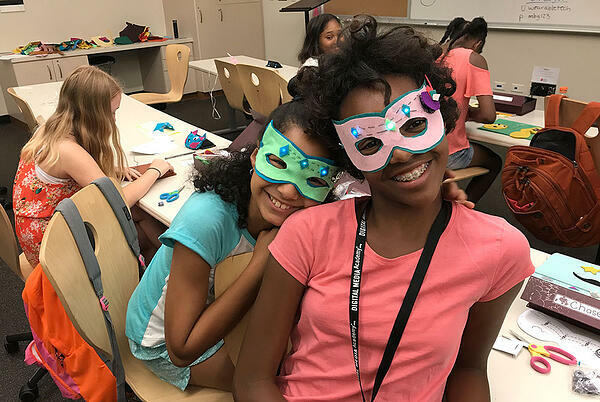 The Made By Girls summer STEM camps create a collaborative, supportive environment for girls to explore in-depth topics with curriculum created by women mentors and professionals. DMA's Made By Girls: Adventures in Wearable Tech & Fashion Design courses are offered at two age ranges: 8-12 and 12-17. Both focus on the engineering design process - from sketching to hands-on completion of wearable tech projects. Launched in 1999, iDTech has grown from serving 280 students to more than 60,000 students per year nationwide. 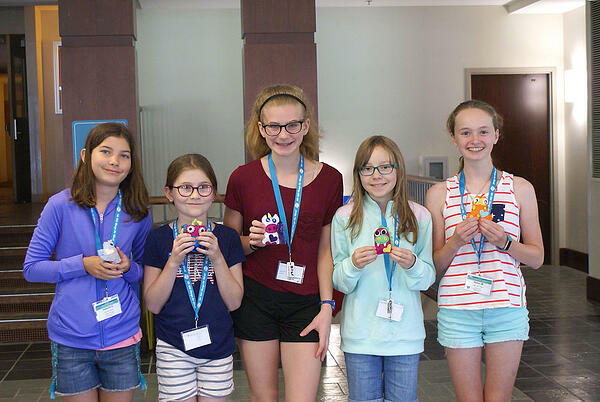 In 2015 Alexa Café, a tech camp focused on girls, was launched, offering a variety of topics ranging from film and animation to robotics. This year's Engineer Shop: Build and Code Wearable Tech is for girls ages 10-15 and uses LilyPad Arduino to teach coding, design, and construction techniques for wearables. Founded in 2012, Girls Who Code has served over 90,000 young women across the country with programs including afterschool clubs, two week summer intensives, and seven week summer sessions. 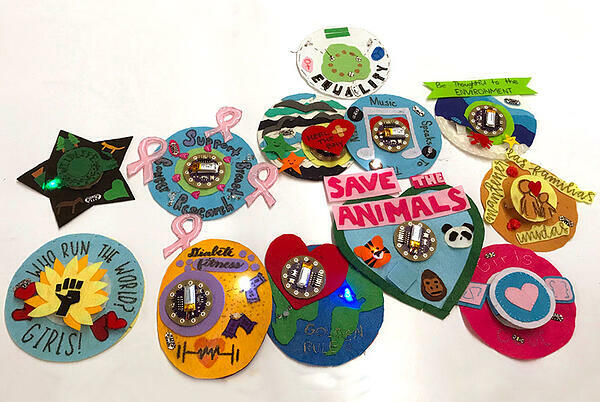 This summer's two-week campus course on Wearable Tech & Fashion Design for ages 13-18 includes building a capstone project in addition to active workshop time, prototyping, and learning to program with LilyPad Arduino. We reached out to each of these organizations to learn more about their efforts around engaging young women in technology through designing and creating with e-textiles. How long have you been offering an e-textile option in your summer programs? Marcus: This is our 2nd summer offering a Wearable Tech and Fashion Design course for our Made-by-Girls program! Alycia: We introduced the LilyPad Arduino to our all-girls camp, Alexa Cafe, in 2015. This is a unique course that can only be taken at Alexa Cafe. Jasmine: This is our first year offering the Wearable Tech & Fashion Design course for our Girls Who Code Campus Program. Over two-weeks, girls explore the ever-expanding world of wearable tech using LilyPad Arduino and the text-based programming language, C. They design and build projects that teach them about circuits, sensors, and techniques for crafting wearables. Their final team project is a piece of wearable tech that solves a social problem or reflects their personal interests. 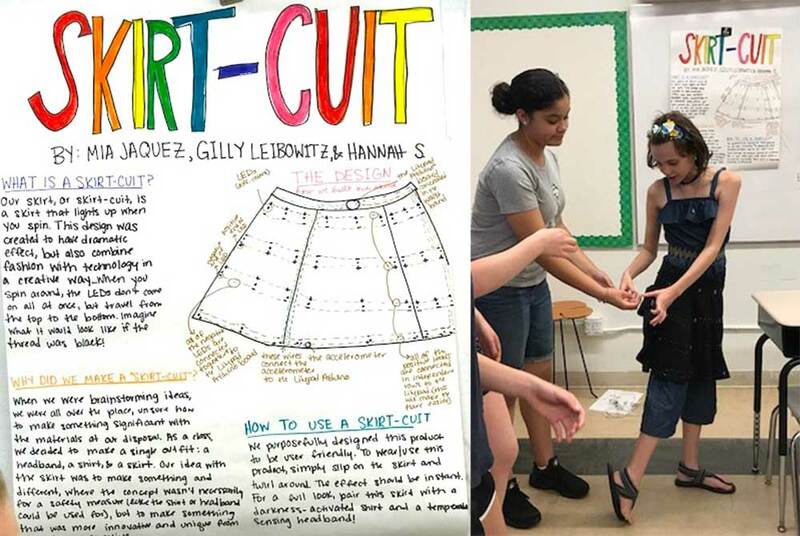 Left: poster for Skirt-Cut project, Right: campers showcasing the finished project. Image courtesy of Girls Who Code. How many young women do the programs serve yearly? Marcus: We have ~150 girls this summer going through the course. Alycia: We've grown exponentially every year from 5,500 young women in 2014 to almost 13,000 in 2018! While we have an all-girls camp, 80% of those registrations (10,400) are attending our co-ed camps. Jasmine: Girls Who Code will have served almost 90,000 girls through spring 2018 and we have reached nearly 12 million people indirectly through our book series, website, videos, and social media content. What is the biggest challenge in creating an immersive camp experience around wearable technology? Marcus: Sewing ability of these youngsters is a challenge, also getting them comfortable with Arduino to program their creations, and not being intimidated by code. 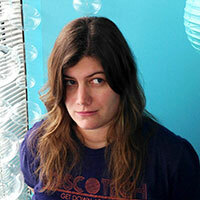 Alycia: Getting the students to scale their projects to something they can finish in a week. Our students think big; they're not just learning technology they wrap up in a few days, they're thinking about how they can use what they've learned a year from now. Jasmine: The greatest challenge in creating an immersive program experience around wearable technology is the variety of expectations on what exactly is wearable tech. Most students assume it is just smartwatches or fitness trackers and while those are popular examples of wearable tech, we want girls to see the bigger picture. We want them to understand why wearable tech is important, who creates it, how can we transform technology into a wearable physical object that solves problems. They will explore how wearable tech can impact lives. Examples of the "What You Stand For" project using LilyPad Arduino Simple Snap and LilyPad components. Image courtesy of Girls Who Code. What are the benefits of a girls-only program? Marcus: Made By Girls offers a unique learning experience designed to introduce girls to STEM learning in a collaborative and supportive environment. MBG is powered by a dynamic group of female role models including educators, industry leaders, artists, makers, and creators who inspire our students to build 21st century skills and confidence both in and out of the classroom. We believe we can make a difference in helping girls realize their potential and encourage them to express their creativity every step of the way. Alycia: Our students know they're in an environment they belong from day one. They could be there because they're interested in leadership opportunities or are nervous about joining the tech field and want to try it in an inclusive space. Jasmine: Girls face systemic and persistent challenges in the tech field, and we’ve designed our programs specifically to help girls address and overcome those challenges. Our programs not only teach girls to code, but they teach confidence and bravery, bring in role models to explore careers in tech, and connect girls to a sisterhood of girls with similar interests. 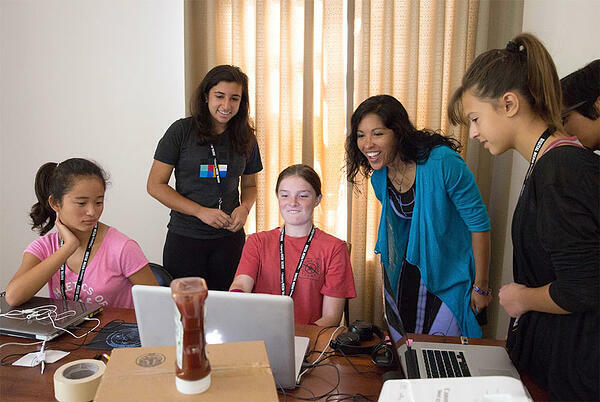 We think these are critical ingredients for girls to persist and success in the tech field. Two campers collaborate on a bracelet project with LilyPad Arduino. Image courtesy of Girls Who Code. Do you feel like there is an ideal age range where e-textiles are most successful? Marcus: We run the course for 8-12 year olds and 12-17 year olds. Sewing with under 10 can be a challenge but if you start slow and build their patience it can work. Alycia: We offer our e-textiles program to ages 10-15 with the 10-12 year olds focusing on creating circuits and simpler coding concepts, while the 13-15 year olds are heavier coders. Simple projects might focus on stuffed animals with blinking LED eyes; one student made hers for hospitalized children. Others are more complex; a student sewed a Simple Board into her shoes with a light sensor so they would light up in the dark. Jasmine: We offered this course to 13-18 year old students, but had a few girls that were younger express interest. 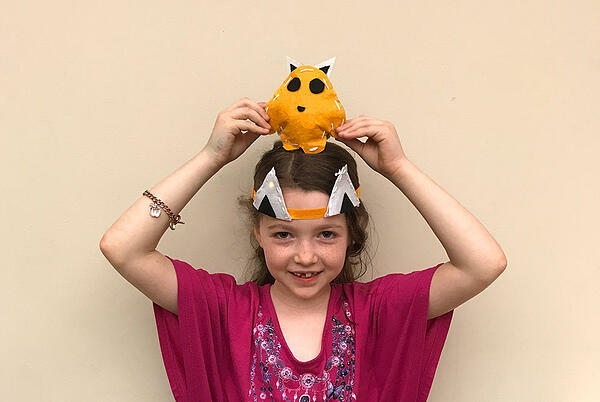 We feel that girls of all ages can get value out of exploring wearable tech, but when selecting our course’s age range we considered this age group would have some experience with programming and crafting, and would be eager to take the next step with wearable tech. Camper shows off two projects, a light up headband and plush creature. Image courtesy of Digital Media Academy. 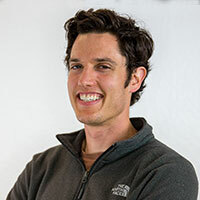 Why did you choose LilyPad for your courses? Marcus: Because it can be sewn to fabric easily, and the sensors and actuators are built right in to break off and use after practicing, great design. Alycia: We had just run our first Alexa Cafe in Palo Alto and it was a huge success, so we decided to run 10 more camps the next season. While many courses we would offer mirrored what we had at our co-ed camps we wanted to have a course that was completely unique. 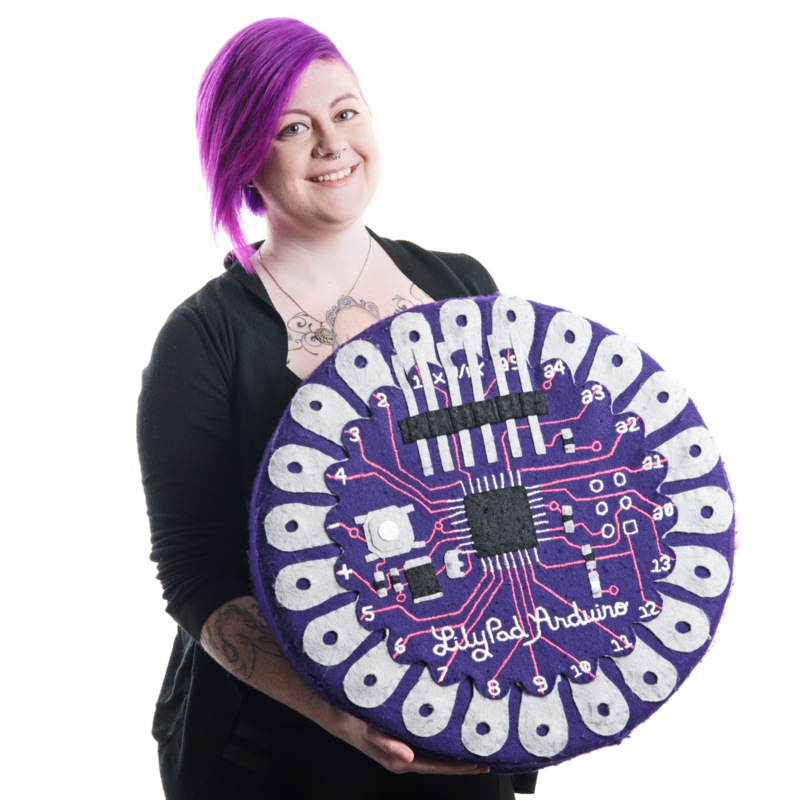 The LilyPad Arduino was selected because it was designed to bring young women into electrical engineering and coding. Jasmine: We chose LilyPad because we respect Leah Buechley and she is featured in one of our Women in Tech Spotlights for the course. We believe that girls can be what they can see, and these spotlights are designed to help them see how they too can work in the tech field. LilyPad has been around now for awhile and felt like a reliable board, and there are a fair amount of resources available for girls to continue their exploration after the course ends. 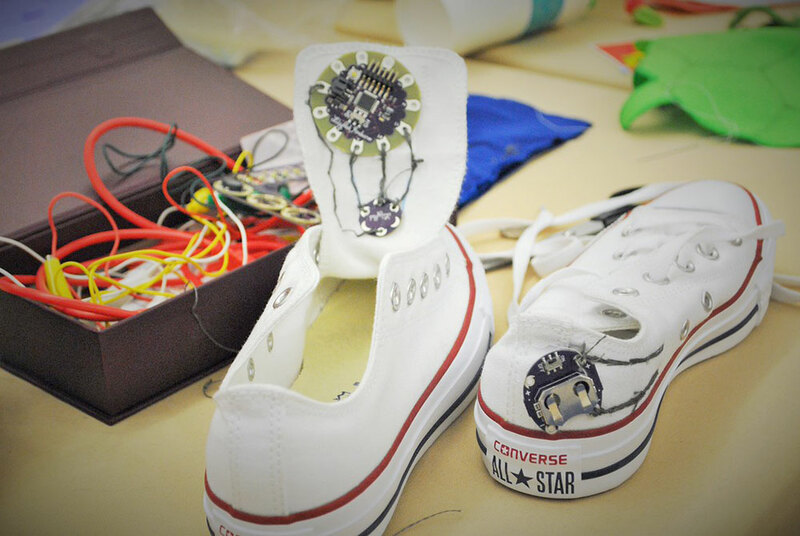 Alexa Cafe student project: sneakers that light up in the dark using a LilyPad Simple Board and LilyPad Light Sensor. Image courtesy of iDTech. Do you have any stories or quotes from participants about their favorite parts of the camps? Marcus: Uma B. attended our Made-by-Girls program and was inspired to create her very own public STEM program in East Palo Alto. Using Snap Circuit sets purchased through an IEEE (Institute of Electrical Electronics Engineers) grant, Uma wrote her own electrical engineering curriculum and taught week-long free courses to kids at the East Palo Alto Library. 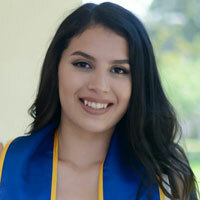 Made-by-Girls program graduate Uma B. (second from left) teaching in East Palo Alto. Image courtesy of Digital Media Academy. Alexa Cafe students showing off their plush projects. Image courtesy of iDTech. 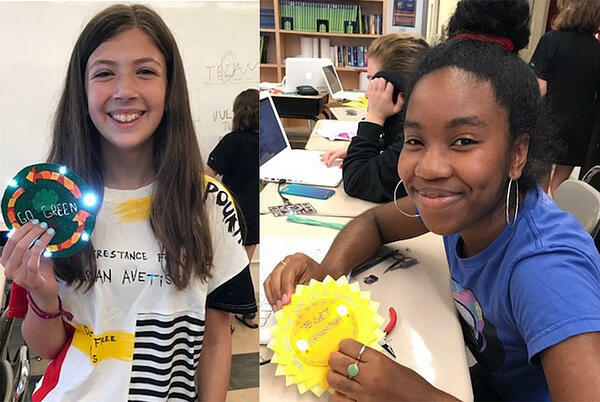 Girls Who Code Campus students with light up badges they designed . Image courtesy of Girls Who Code.